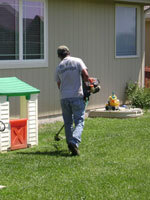 At Rothwell Landscape, Inc. we offer high quality cost effective mowing services. We perform directional mowing to create aesthetic patterns on the turf. We trim around all the obstacles on the property. We edge along the curb, driveway, and sidewalks. The last step is to use a blower to clean off all the paved surfaces to finish the clean cut look. We make mowing a hassle free process for our customers. Each customer is scheduled for a certain day of the week. We try our best to stick to that day so you will know when the crew is coming to mow. The service is on a weekly as needed basis. This means that during the hot summer months the crew uses their best judgment on whether the yard needs to be mowed that particular week. We can also custom tailor the program to meet your yards individual needs. The mowing services are conveniently billed at the end of the month. We can even set up a credit card on file to bill once a month and just email you the receipt. This helps further our "go green initiative.